U.K.-based AliveLab has expanded its line of Mardles products featuring AR for 2018. 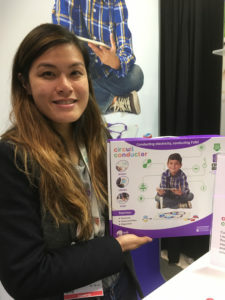 The company spotlighted prototypes of five interactive storybooks using AR at Toy Fair last year. Since then, it finalized those SKUs and made them “fully interactive,” James Murden, who co-founded the company with Sharon Wyness, told MESA at the show Feb. 17. 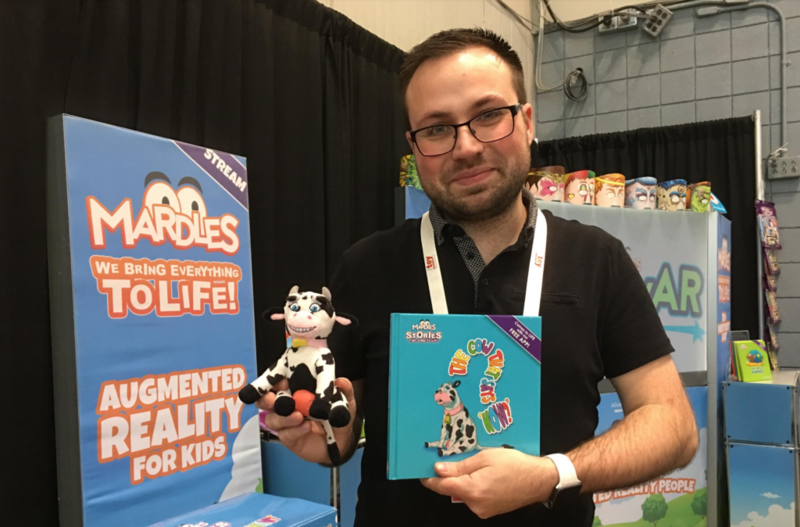 When we saw a demo of one of the books — “The Cow That Says ‘How?’” – in conjunction with the accompanying AR app at the show last year, the characters that came to life via AR were contained to the page of the book. A demo this time showed that the characters can now move around beyond the pages of the book and appear to be walking on one’s table … or wherever else the user places the book while holding an iOS, Android or Amazon Fire mobile device over it. The company sold 20,000 books in the first three months after it became available in the U.K. in September, Wyness told us. Now, AliveLab is working on U.S. distribution and expects its products will soon be available at retail stores here, Murden said. The company has already been selling its older Mardles AR stickers via Amazon.com in the U.S.
Up next from the company are gift boxes that each contain one of the five AR books and a small plush toy based on a character from the book, Murden told MESA, adding each one will cost about $12.99. AI, meanwhile, is “on our radar” and could be incorporated in a future product, he said, but stressed that the company’s goal is to remain known as an AR specialist, so any product using AI would also incorporate AR. Before adding AI, however, the company would want to make sure there is adequate security in place to protect its products’ young users, he said. AliveLab still has no plans to introduce products that would require VR headsets, he said. But there is still a headset-free VR mode in the company’s coloring books where users can use the mobile device screen in much the same way that one would use a VR headset, and even spin around 360 degrees to see the digital world of the app. “It gives kids the chance to immerse themselves in their digital creation without the need to put their eyes right up to a screen,” he said Feb. 19. That feature is just in the coloring books “right now but we have plans to include it in future product developments as it proves very popular with consumers and retail buyers,” he told us. Merge – the biggest proponent of VR among the companies we met with at Toy Fair this year — spotlighted two new products: Merge Mini, a smaller version of its VR/AR goggles for iPhones and Android smartphones that, at $29.99, is $20 less than the full-size version it’s still fielding, and Merge 6DoF Blaster, a plastic gun designed to be used as an accessory for Android and iOS mobile games. An iPhone or Android smartphone locks into place on top of the blaster, with the screen facing the user. By 6DoF, San Antonio, Texas-based Merge was referring to the concept of six degrees of freedom. 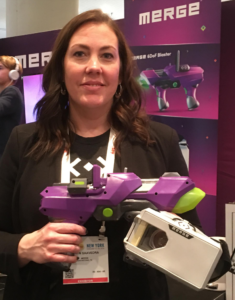 As Taryn Saavedra, Merge marketing director, pointed out to MESA while demonstrating the $39.99 blaster at Toy Fair, users are free to walk around and move freely indoors or outdoors while using the device. There are also no wires or wearable devices like a headset that can get in the way. The blaster tracks the user’s movements in the real world using positional tracking technology, according to Merge. Both new Merge products are expected to ship this summer. The blaster demonstration at Toy Fair only used Merge’s own app, but the company is opening its software development kit to enable third-party developers to create their own apps for the device, Saavedra said. Merge is also releasing its manufacturing specifications to other companies, so they can create their own devices that will be compatible with the blaster, she said. 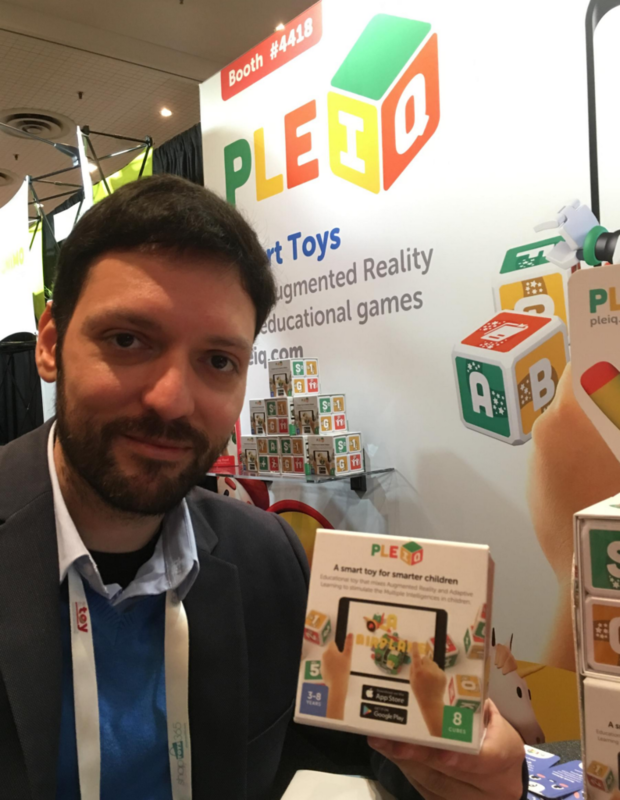 Chile-based startup PleIQ’s first product is a smart educational toy that uses AR to help kids develop math and other skills. 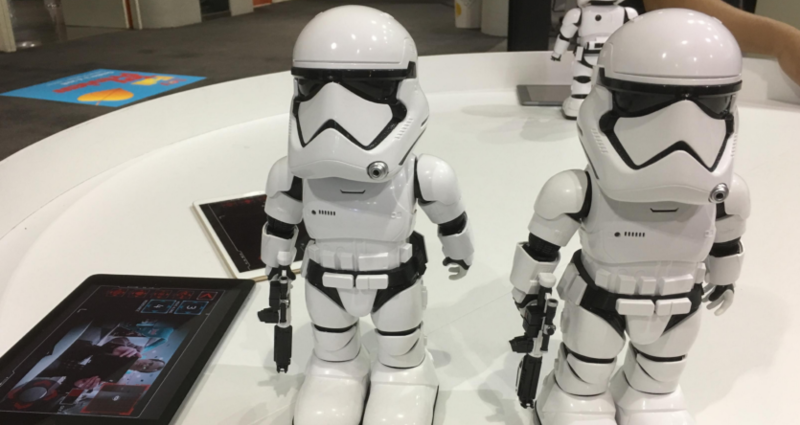 It was already available in Argentina, Chile and Mexico since late last year and is now launching in the U.S. at $44.99, Edison Duran Lucena, the company’s CEO and co-founder, told MESA at Toy Fair, noting it was his first time exhibiting at the event. “Hopefully, we will see it on Amazon in the next few weeks,” he said, adding he was in talks with U.S. retailers. The company started in Venezuela in 2014 but moved to Chile after being chosen for the Start-Up Chile seed accelerator program created by the Chilean government, he told us. The initial PleIQ product is made up of eight learning cubes that work in conjunction with an Android and iOS application for mobile devices. Letters, numbers and symbols on the cubes are transformed into 48 learning experiences that use AR and headset-free VR, and adapt to each child’s learning needs, according to the company. The product can adapt to each user like that thanks to adaptive learning technology, which Lucena identified as a form of AI. Up next from the company is PleIQ Stories, including a physical Little Red Riding Hood book and a cube that also work in conjunction with the mobile app. It recently went on sale in Chile and will expand to other countries, Lucena said, adding the timing of the U.S. launch (at $34.99) will depend on the success of the company’s introductory product in the market. The company has no plans for VR products requiring a headset, he said, telling us there are just too many issues with such hardware. AR and hands-free VR allows kids to play offline with a traditional toy as well as with a digital device, and combines the “best of the two worlds,” whereas VR provides just the digital experience alone, he said. Los Angeles-based Skyrocket Toys didn’t introduce any new AR or VR products at Toy Fair this time after heavily touting the Recoil laser tag game featuring AR and 360-degree VR Entertainment System (VRSE) in 2017. Although Skyrocket featured Recoil and its two VRSE SKUs (one Batman-themed, one “Jurassic World”-themed) at its booth this time, we likely won’t be seeing another AR product from the company until 2019 and won’t be seeing more VR products from it anytime soon, according to Skyrocket CEO Nelo Lucich. Recoil “did pretty well” for the self-described “tech-entertainment” company last year, but it performed “a lot better” after Skyrocket became “more aggressive on price” and lowered the MSRP from $129.99 to $79.99 for the starter set, he told MESA. Several retailers were selling Recoil for under $70 Feb. 19. The top end of the market has been “lost to videogames,” especially among boys, Lucich said, pointing to the huge number of people who bought the Nintendo Switch in particular. The biggest challenge with AR devices for kids, however, is communicating to adult consumers exactly what the technology does, he said. The VRSE sets each include a VR headset that works in conjunction with an iPhone or Android-based smartphone, motion game controller and controller attachment. Sales improved after Skyrocket lowered the price to $29.99 from $49.99, but VRSE didn’t perform “at the level we expected,” he said, speculating: “Maybe there’s just a glut of VR products out there and too many choices” for consumers. Another problem is that VR goggles tend to be a “non-starter” when it comes to female users, he said. Skyrocket is working on development of AR products for 2019, but not anything with VR and the company is focused this year on lower-priced products, he said. Of VR, he said it’s just “difficult to sell a standalone platform” and users are also too isolated when wearing the goggles. AR, on the other hand, is still “challenging” but more suited for toys,” in part because it doesn’t require a headset, he said. 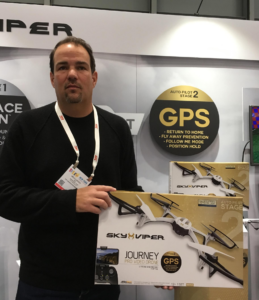 The company is also “looking at” using AI, including for a next-generation version of its Sky Viper Journey pro video drone, he said. One challenge with adding AI to toys, however, is the added cost that requiring Wi-Fi adds to a device, he said. Device makers also need good security and privacy protection – especially when children are the main users, he said. AI will work well with the drone because the targeted consumer is older than Skyrocket’s other products, the device is used outdoors, and the company already has a good security system in place for its drones, he said. SpiceBox touted two new STEM products as part of its further expansion into the toy category from its initial focus on kids’ books. The Professor Maxwell’s 4D Chemistry Augmented Reality Chemistry Lab and 4D Science Augmented Reality Science Lab. Each kit includes 10 interactive projects, a 30-page book, a lesson plan, hands-free AR goggles, a beaker and other materials needed for the projects. Like the vast majority of AR-based products shown at Toy Fair, the SpiceBox kits work in conjunction with a free Google Play or iOS app. The company started taking orders for the kits at $49.99 each via its own web site, which indicated Feb. 20 they are expected to be released April 1. But Amazon started taking pre-orders for each kit at only $39.99 each and indicated the chemistry SKU will be released March 1, while the science SKU will follow March 15. 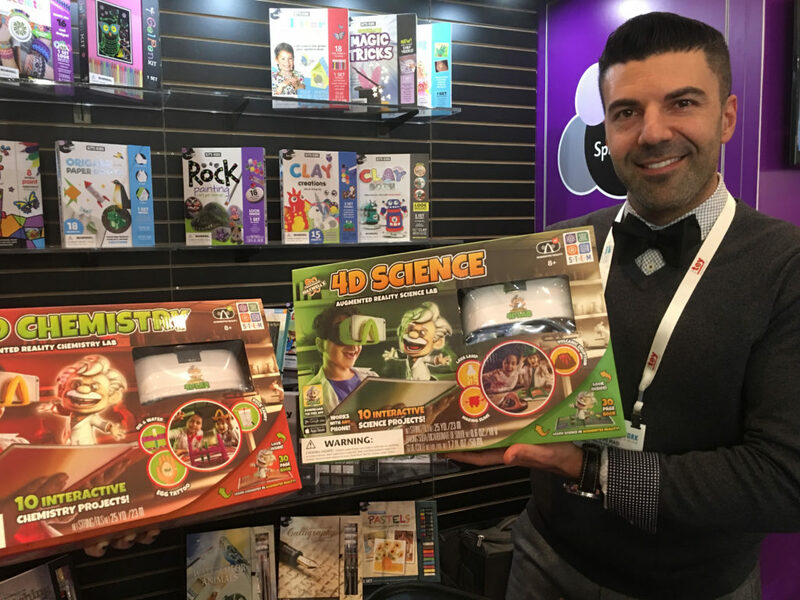 By featuring goggles in the products, SpiceBox stands apart from the vast majority of toy companies that touted AR at Toy Fair this year. Explaining why SpiceBox felt it’s important to include the goggles, a spokeswoman told MESA: “We want it to be an immersive experience” – and that’s just not possible without a wearable item. The company also wanted the kits to provide a “hands-free experience,” Steve Rad, VP-sales & marketing, said, indicating that was easier to achieve without the user having to hold a smartphone or tablet up to experience the AR. Also significant is that “no lesson is more than three minutes,” so kids and their parents don’t have to worry about issues such as pain from wearing the goggles too long, he said, adding users are directed to take a break and take off the goggles after each lesson. Retailers including Barnes & Noble and specialty stores will carry the products, Rad said, adding he saw the kits as “our gateway” to opening relationships with toy sellers. 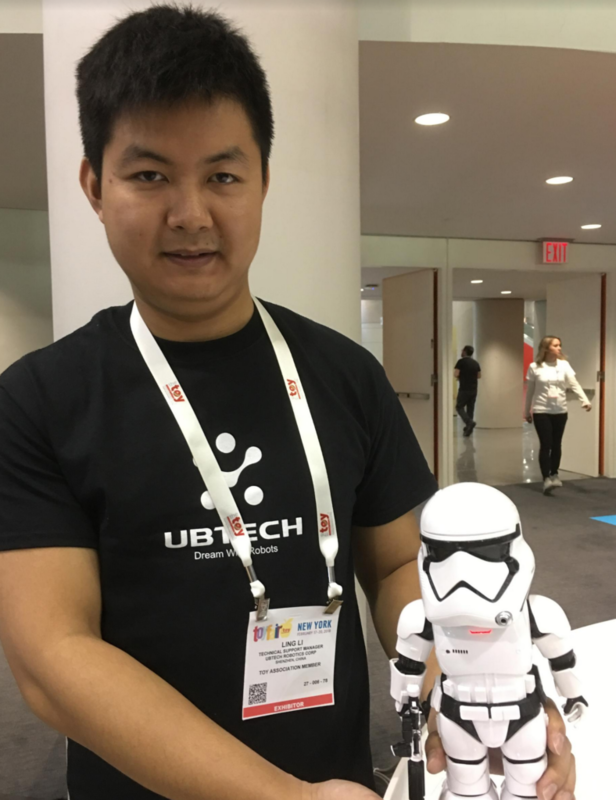 China-based robotics company UBTECH touted a “Star Wars”-licensed First Order Stormtrooper Robot with a companion app that features an AR experience when using the Mission Mode, along with facial recognition and voice command. It’s the first time UBTECH has used AR in one of its products, Ling Li, a technical manager at the company, told MESA. The robot is targeted at consumers 14 and older, and costs $299.99, he said, noting it shipped late last year and is being sold in the U.S. by retailers including Best Buy and Amazon. Although there was only a single-player mode in the demo we saw at the show, multiplayer functionality will be added as part of a planned update in May, he told us, adding “we’ll keep updating” to enhance the robot. More AR products are planned by the company, but it was too soon to provide details, he said. UBTECH, meanwhile, has already incorporated AI into its products, he told us, pointing as an example to the Lynx, an Amazon Alexa-enabled smart home robot that was being sold at Amazon.com Feb. 19 at $774.12. That product, however, wasn’t shown by the company at Toy Fair for a simple reason: it’s not a toy, Li said. Unlike most of the companies we met with at Toy Fair this time, VR is “on the list” of possible features UBTECH is considering for future products, he said.